The Pathology Department is based at Hillingdon Hospital, with services at Mount Vernon Hospital. Your GP may request you come to the Pathology Department for a test (eg blood test). You will normally receive an indication of the results from your GP over the telephone. If the result of the test warrants further discussion or is complex, you may be asked to make an appointment to see a doctor or nurse to get a fuller explanation. The pathology department is working towards the national modernisation agenda, particularly looking at improved computer systems and network development across West London. 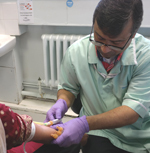 Please ensure that you bring any forms which your GP has given to you specifying the test procedures required, and follow any special instructions your GP has mentioned (eg fasting) in relation to those tests. At Hillingdon Hospital: Phlebotomy is located in the annex corridor on the lower ground floor at the rear of the hospital. Follows the signs for 'blood tests'. The department operates a walk-in service, so you don't need to make an appointment. However this does sometimes lead to delays at the busiest times. The Hillingdon clinic opening times: Monday-Friday, 7am-4.30pm. Please note: The department’s doors normally close at 4.30pm so that staff can process any patients who are already there. No blood tests are performed after 5pm. Occasionally, when there is heavy demand and/or low staff availability it may be necessary to close earlier than 4.30pm. You might want to ring the department (01895 279147) if you are attending after 4pm and want to be sure of the closing time on that day. At Mount Vernon Hospital, Phlebotomy is located in the Pathology building (next to the Postgraduate Centre). The department operates a walk-in service, so you don't need to make an appointment. However this does sometimes lead to delays at the busiest times. The Mount Vernon clinic opening times are as follows: Monday-Friday 7am-4.30pm. Please note: The department’s doors normally close at 4.30pm so that staff can process any patients who are already there. No blood tests are performed after 5pm. Occasionally, when there is heavy demand and/or adverse staff availability it may be necessary to close earlier than 4.30pm. You might want to ring the department (01923 844732) if you are attending after 4pm and want to be sure of the closing time on that day. If you are a patient at the surgeries (listed below) you have the option to get your blood test done there as a booked appointment, please contact the surgery for details of when the service is available and to make an appointment. Hughenden health centre, Prestwood health centre . For an appointment at Hillingdon Hospital, please ring 01895 279147. For Mount Vernon Hospital ring 01923 844732. Please note that if you wish to have this test performed quickly, you may be best advised to make an appointment at Mount Vernon Hospital. These are NOT 'taking blood' clinics - see phlebotomy times above.